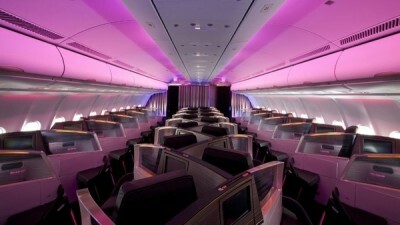 This is my review of Virgin Atlantic Upper Class on the A330 aircraft. 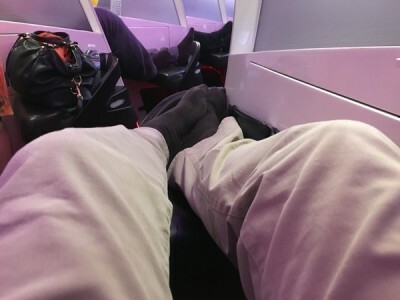 Coming back from New York 10 days ago, I was legged over – twice – by Virgin Atlantic. I wasn’t amused. I was booked on VS4, the 6.30pm departure from JFK to Heathrow. When I went to check in, I saw a note on screen saying, in effect, ‘as we emailed you to say, your flight time has changed, we hope this is OK’. Saying that ‘my flight time has changed’ was being a little disingenous. Virgin had taken me off VS4 – which was still operating – and moved me to VS138, departing 90 minutes later at 8pm. And, of course, I hadn’t had an email letting me know. VS4 was totally full in Upper Class with no tickets for sale. I have no idea why Virgin moved me, but I imagine it was because they felt they had a better chance of reselling a seat on VS4 rather than VS138. The VS138 was an A330, you see, and Virgin’s A330 Upper Class is a dog. This is because it has the Upper Class layout above. This has an exceptionally bad reputation and I had purposely avoided booking myself onto it. This is not just my opinion. 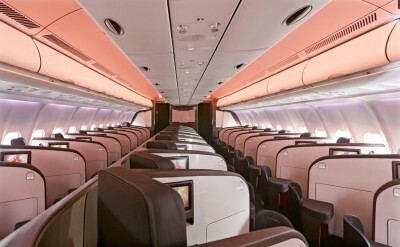 The A330 Upper Class layout is such a dog that Virgin Atlantic has just started ripping out the cabins – just five years after they were installed – and replacing them with a less dense layout. Business Traveller covers the story here. What is currently 1 – 2 – 1 will become a similar 1 – 1 – 1 layout akin to what is on the new Boeing 787 aircraft. I am 6′ 2′. My feet are against the moulded rest at the bottom of the bed. You will see that my knees are lifted into the air because it is impossible to get my legs straight. The end result is that I had, by a very considerable margin, the most uncomfortable overnight business class flight I’ve taken in a long time. By this time next year, there should be no reason to avoid the A330 Virgin Upper Class fleet. For now, I recommend giving it a miss – but then, I tried to give it a miss and Virgin Atlantic chose to move me anyway …..
PS. Here’s an interesting comparator. The last time I was in the Virgin New York Clubhouse was when I was flying Singapore Airlines (review here). Whilst I was in the lounge, I was paged to return to the desk. Singapore Airlines was on the phone. They wanted to move my seat back by 1 row so a couple could sit in adjacent seats. They would only do this, however, if I gave my permission (which I did). This time, Virgin moved my entire reservation to a different flight and didn’t even bother to tell me …..
O/T but Virgin related. Hit target spend on White Amex/Visa Cards several weeks ago and working towards spend target on Black Amex/Visa cards. No FC points posted yet. Do they often take a while to post? More used to avios which seem to be posted pretty quickly. thanks Genghis, went through the spend for the White Card really quickly so haven’t even had a statement yet! Due in next couple of days. On A330 refits – VS are well behind schedule so flights that were previously thought to be 1-1-1 end up being 1-2-1 at short notice. You need to keep checking back in MMB, especially in the last couple of weeks before your flight. I flew LGW-BGI recently and had 1-2-1 on the way out and 1-1-1 on the way back, so had the chance to try both. Agree 1-2-1 was perhaps an attempt at Cruz-style squeezing the lemon a bit too hard, but 1-1-1 is totally acceptable on the A330. These being my first VS flights after a long time of just flying BA reminded me how much better the VS hard (in 1-1-1) and soft product is. Just wish they had a better set of destinations. 1. take the reroute offered (in UC), and a free Y reward return / or 50k miles / or 600 EUR in satisfaction of EU261. 2. rebook for another date in Y, and a free Y reward return / or 50k miles / or 600 EUR in satisfaction of EU261. 4. cancel, refund of unused flight, and and a free Y reward return / or 50k miles / or 600 EUR in satisfaction of EU261. I flew MAN BOS last week and BOS MAN yesterday, on the same plane both ways. The seat was tired. Leather was cracked. The TV screen didn’t stow properly. I couldn’t wheel my little cabin sized suitcase down the aisle without it bumping into everything. I chatted to the crew about the fact that it was 1-1-1 config on my reservation right up until around 24hrs before the flight when it changed to 1-2-1, both legs. They said that they hadn’t seen the new A330 either. They said 3 planes had been refitted, more were due to go to get refitted but was delayed because summer season has got busier and they needed all the planes in action. Have flown on the A330 a few times and feel it’s reputation is undeserved, with one caveat. The little shelf for the Champagne (other drinks are available) is in a much better position: as is the reading light. I found the seat much comfier than A340 I’d travelled on previously; and have just arrived at Heathrow an hour ago from in UC on a 787 and found that seat not quite so comfy. I’m six feet tall, large and don’t sleep on planes which may impact my experience. All the above said; seeing the person opposite you sit with their bare feet on the ottoman is something I can’t bare. So for that reason will be glad to have an aisle where you don’t see that. It seems the less important issue (dislike of seat design about which they’ve already admitted defeat and are replacing) is distracting people from the bigger point about reward flight tickets being bumped to flights people might not have chosen… It would be interesting to keep tabs on how common this is. Similar thoughts spring to mind where our good friend BA might bump or downgrade a 241 reward pax in favour of a last minute wealthy cash paying J pax! I tried the 787 layout. Thought that was pretty cramped for my 6ft3 frame. Can’t say I can give it the full assessment because I had too much to drink and didn’t test the sleep mode properly but the seat felt a lot more claustrophobic than CW. Tbh, I find it hard to chose between the two and they stand as mediocre products at best. UC staff were much more friendly. The CW lounge food was average but very nice space at LHR, actually preferred the BA buffet catering. I have reviewed the 787 on here. Agree with the claustraphobic comment – it just didn’t ‘work’ for me. I didn’t like staring at the cabin dividing wall either. It was still a darn site better than the A330 version though. If you refer someone you get 5,000 points and they get 11,000 rather than 10,000. If you need to be referred ask Rob. 2 years in a row Virgin have cancelled a mid week November flight to Shanghai messing up my schedule. At least the last flight was on the 787 and the seats are pretty good…though I still dislike having the seats angled towards the isle rather than the window. Looking out the window is still a pleasure on a long flight. Flew out to NYC Thursday on VS1 A330 1-2-1 cabin. Check in, dedicated security channel and the Club lounge blows BA out of the water. On board crew and service excellent. Due back tonight again A330 1-2-1 cabin from JFK not worried in the slightest. Seat may not be the latest and greatest but to call it a dog is more than a little woof! Let us know tomorrow how you found it! Hopefully that update will be coming soon! I just wanted to give people a heads up about Ihg Creation Credit card . I have an on going dispute with them and Have had it confirmed by there Head of complaints that To get your free night that you earned in the previous year you would need to pay for the card in the New year with no refund regardless if the card was used or it . They said they would fight any complaints to the Ombudsman . Might be worth phoning up again, ask for the ceo personal email, say you will take it all the way to the press. They might agree to refund if it’s agreed by the ceo, after all they won’t want to bothered by such things.. l am in a similar bind with the hsbc premier elite card rolling over to year 2. As rob has mentioned here, the OMB would take a dim view of that activity, esp if the card is unused. The deal is you have earned that night, whether you renew or not. They might just be calling your bluff. Creation told me last year that this was their strategy, so I am not surprised by this response. I am dubious about it standing up under Ombudsman scrutiny, frankly, for obvious reasons. Just spoke with the Ombudsman and they said they could not take this on. Surely the T&Cs don’t say the certificate is awarded on the anniversary AND subject to the paying the 2nd year fee! Did they say why? Have you issued a formal complaint and waited the necessary time (8 weeks) / been issued with a final written response? It sounds like they want to force people to renew which is rather desperate just to get the annual fee at the expense of annoying customers and making many cancel the year after. FCA will do nothing also as spoke with them only option is legal action . If it is a breach of the T&C then I doubt they have any choice but to take it on. Would you not be better speaking to FOS rather than the FCA? The FCA don’t deal with individual complaints, the FOS do. Looks like BA is desperate for cash after their recent IT meltdown!!!! How does IHG view this ridiculous stance Rob as ultimately it will hurt their brand? Truth is, in the world of 0.3% interchange fees, you need to make your money where you can. If you are a long term holder of this card, this rule doesn’t really hit you – the longer you have it, the less it matters. Over 5 years and 5 vouchers you would pay 6 fees etc. Would people recommend complaining before the end of the year or waiting until paid the fee? So let’s think about this. Fee is due payable end of month 13? We don’t know how fast the voucher will post but if it’s during month 13 you can then cancel? I’m now planning on keeping it for Mrs G and I as we spend 2 x £10k on non Amex easily. He steps down from the CEO role on 30th June and retires at the end of August. Either way he is not going to be interested in this!! Thought I would share my experiences for Virgin. Twice they have cancelled / changed my flights without giving me any notice. Despite them saying they have sent an email, which i never received. Second time they cancelled my flight to the Caribbean and moved me to the flight the day after. Resulting in me losing one night of a prepaid hotel. Both instance were booked using miles. Seems they are happy to chop and change redemption passengers in favor of cash payers. Not surprisingly customer services were unhelpful. They must be adopting the BA model! Actually all major airlines do this. Revenue passenger being more valuable than redemption ticketed passengers. The belief that BA are the only culprits came about mainly due to the recent mis-treatment received by one of our HfP readers traveling to the Maldives. Exactly the same experience here. They kept moving my flight to NYC to the extent that I finally gave up, cancelled it, and flew AA.